Personally the 50s started off well with my twin brother and I celebrating our 21st birthday party in a local hall. And the start of a five-year courtship and having to work and save up to pay for our own wedding owing to our Mums both being widows with little income and living together before marriage was not done then. Women then left work to be a Mum and it was not always easy for there was just your husband’s wage to live on and save for what are now considered necessities such as washing machines, televisions, telephones, fridges and freezers. 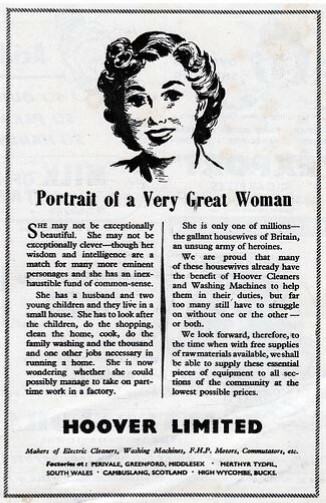 Hoover Limited advert, Lennox Herald, 1956. Courtesy of West Dunbartonshire Council Archives. Our wedding took place on the 25th March 1955 and we lived with my mother-in-law for the first year, then we were fortunate to rent a room and kitchen and inside toilet in the bottom floor of a tenement building near the centre of our town, where our first baby was born in December 1956. Then there was the shopping which meant having to push a strongly built pram with a baby in it and wire rack between the four wheels filled with shopping and pushing it to and from local shops and if you lived up or down a hill too bad for public transport was not designed to take prams. 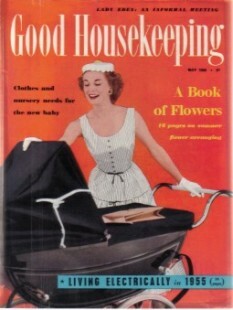 Good Housekeeping magazine cover, 1955. Plus all the housework had to be done by hand and of course men did little if any of these chores then. Don’t get me wrong, we were happy with what we had and trying to save for better times. It had been quite a struggle at times for although the NHS had come into being in 1948 there were lots of benefits not felt until well into the fifties. Such as Maternity Benefit and when it was brought in it was not paid for the first child. As you can see the 50s were mostly a time of rebuilding for our town and people who had a lot to be thankful for. For me these memories that come flooding back are of how those years had been such a very special time in my own life.